Further trials of the Storm Shadow deep strike missile and Meteor Beyond Visual Range Air-to-Air missile have been successfully completed as part of a program of improvements which will further enhance the powerful swing-role capability of the Eurofighter Typhoon combat jet. It has been confirmed that a new operational release of the Storm Shadow missile was carried out in the U.K. Ministry of Defence’s Hebrides range in Scotland. The release — from the Italian Instrumented Production Aircraft — is part of work conducted to expand the safe weapon trajectory data envelope of the missile. 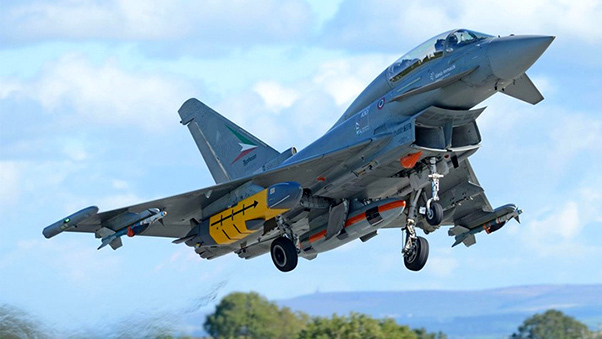 The test, which was led by Finmeccanica -Aircraft Division, with the support of Eurofighter, BAE Systems, Airbus Defence and Space, and MBDA, follows the completion of ground trials on the weapon and a successful release of Storm Shadow in November 2015. It was followed by another firing of a Meteor Beyond Visual Range Air-to-Air missile using UK Typhoon aircraft IPA6, also at the Hebrides range. Led by BAE Systems with support from MBDA, Selex, QinetiQ and U.K. Ministry of Defence (MOD) and the Eurofighter teams. The firing follows trials held in late 2015 which saw the Typhoon aircraft conduct guided Meteor firings against real air targets in pre-planned scenarios. The Storm Shadow and Meteor firings are part of the flight test campaign for the Phase 2 Enhancement (P2E) program which will introduce a range of new and improved long range attack capabilities to Typhoon. Steve Greenbank, Director of Aircraft Programs for Military Air & Information, BAE Systems, said: “These latest Meteor firing trials are another step forward in the integration of the missile onto the Typhoon aircraft, demonstrating they can operate safely, accurately and effectively. In addition to Meteor and Storm Shadow, the integration of MBDA’s Brimstone, part of the Phase 3 Enhancements (P3E) program, is on contract for Eurofighter Typhoon. Brimstone is a precision attack missile with proven capabilities against both static and moving/maneuvering targets.